It can be hard to find a nutrient dense snack that will keep you feeling energized and satisfied without overloading you on carbohydrates. Typically when we reach for a snack it’s a granola bar, cookie, crackers, muffin, or maybe an apple. All of which are carbs, carbs, carbs on top of some more carbs. When we eat a food that’s mostly carbohydrates our body quickly turns it into sugar. This causes a spike in our blood sugar levels, as well as a spike in insulin levels as the body tries to deal with the sugar overload. Soon after this blood sugar spike our levels plummet, leaving us feeling tired and hungry for more carbs. This roller coaster of blood sugar and insulin levels causes us to eat more to keep us feeling satisfied, which will contribute to weight gain, especially abdominal weight gain. Insulin dictates wether the sugar gets allowed into our cells to be burned for energy or stored on the body as fat around the abdomen. The more we call on insulin to deal with excessive sugars the more it will start to store those sugars as tummy fat. Time to rethink our snacking! We need to make snack choices that will support the body to work optimally – giving us energy to stay focused and tackle the events of our day, while feeling satisfied and not hungry. To do this we need to choose snacks that give us protein, fat, fiber and some carbs. 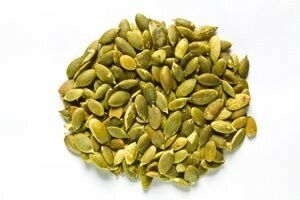 Pumpkin seeds are a great choice that will meet all of those requirements! They are a rich source of protein – 1/4 cup contains 10 gms of protein! Here’s a tasty way to make your pumpkin seeds. Heat a dry frying pan on the stove top using medium heat. Spread a layer of raw pumpkin seeds on the bottom of the pan. Shuffle seeds every couple minutes to prevent burning. Once you hear them pop, take them off the stove and pour them into a bowl. Drizzle with extra virgin olive oil and sprinkle with seasoning. 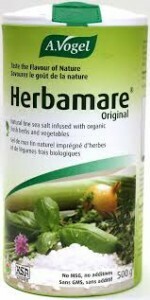 This is a great snack to take with you when you’re on the go, or tuck a container of them into your desk drawer at work.